I wrote this post for those of us who've had every good intention to start 2018 off on the right foot. Yet for each of our own personal reasons, we just seem to be struggling through life's curve-balls and challenges. So my blog post this week starts with a simple realization, then follows with some call-to-actions. And by the end, I hope you've found a new way to look at these challenges in your life that you might not have thought of before. First, Realize This: It's Your Round 1. When we face a challenge, we usually consider it a challenge because, well, we’ve never BEEN through it before. We’re not sure what to do. If this was our Round 2, we’d be working through it with a little more ease, right? This is an important concept for us to realize at the start of any hardship. So let's cut ourselves some slack and accept that this is tough, and we therefore may not be our best selves right now. Don’t try to one-up your hardship at the very beginning. If your situation hurts in any sort of way, allow yourself to feel it. Do what you need to do to truly feel the pain and grieve yourself through it. This is a good thing. Why? Because you VALUE that part of your life. Life and all its happenings actually MEAN something to you. I personally believe you should never “get over” the loss of a loved one, a pet, a relationship, a job, or anything else personal that made up a huge part of your life. Rather, you can learn to live with their memory in a new way. Or, if you’re simply upset about something at work, school, home, or wherever, then remember what I said above. 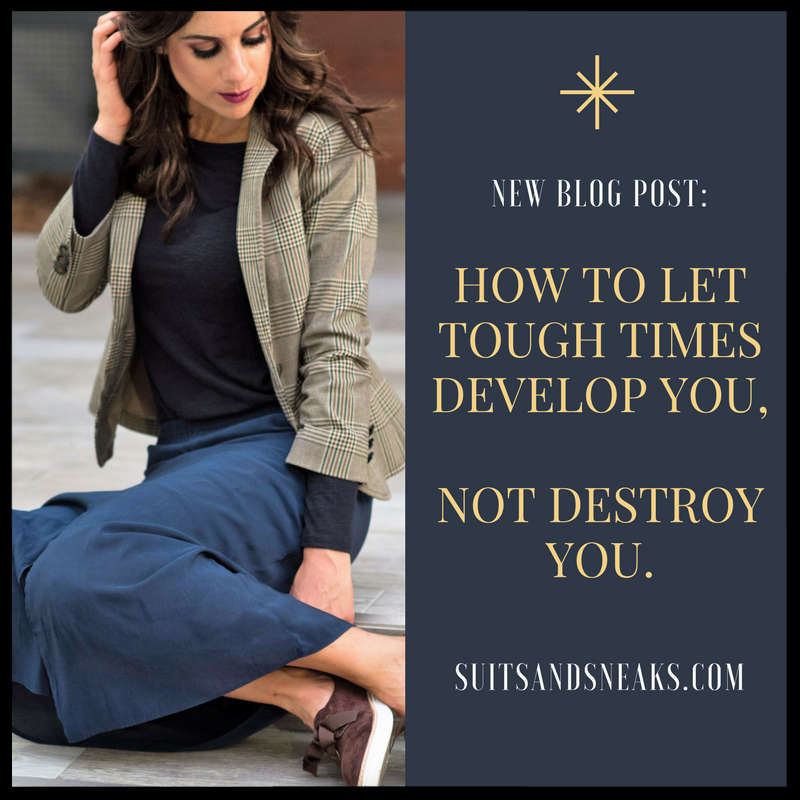 At then end of the day we should let these difficult times develop us, not destroy us. If you find yourself in a continuous pattern of sulk where you feel like it’s destroying you or parts of your life, try this. Zoom out and look at your situation from above. Like a bird watching over you. Really try to understand the entire picture at hand, and how this current hardship plays into your potential 80+ years of life on this earth. This will allow you to visualize from the entire perspective of your past, present, and future. Not just from the perspective as you see things right now. Find your highs. Your happy moments. Your accomplishments. Grab ahold of them to help you walk forward each day. Find your lows. What you perceive as weaknesses. And while you’re zoomed out on your life at a bird’s eye view, the important thing to notice is this. These are NOT in fact low points of your life, they’re LEARNING points. Because as each hour and day passes, you’re actually gaining something. You’re gaining experience, strength, and a deeper appreciation for the things that mean so much to you. So take your challenges into the New Year as a person of strength. Because as each day passes, you continue to learn how to live through them. So that at the end of the day, we let the hardships we face develop us, not destroy us.